The One Club was formed as a group for people living on their own to get together for meals and outings. The group is growing (we have 15 members on the list) and now includes folk from other churches and also several who are not churchgoers. We meet fortnightly on Friday afternoons or evenings and during 2017 met about 24 times. and several folk stopped off for an evening meal on the way back. 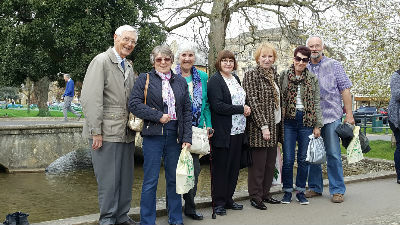 Other outings have included tea and cake at Pillings Lock and Ashby’s 1940s Larder and a visit to a garden centre near to Melton Mowbray was very much enjoyed. We have also been to Ulverscroft Grange, Melbourne village, Welbeck Abbey and Birdland in Desford. We have enjoyed lots of great meals and fellowship together at various restaurants including The Otter, The Priory, Junction 23 and St Josephs, The Plough at Normanton, The Hollybush at Breedon, The Angel at Coleorton, the Pied Bull in Shepshed, the Waterside Inn at Mountsorrel and many others.